Even when you are on a tight budget, it is important to splurge every now and then. And that's just what I did the other day when I was wandering through the produce section at Treasure Island. They had the most beautiful fresh black mission figs for a price that, while by no means inexpensive, was something in which I could indulge without spending all of my weekly allowance. Once I got them home, I had to decide what to do with them. I don't have them often, and the few times I've eaten them I've just eaten them as is. They're such a rare treat for me that I enjoy them just as nature made them. But this time I wanted to doll them up a bit. I recently learned how to make creme fraiche so I had some in the refrigerator. I thought a dollop would be nice over lightly poached figs, and the sherry I have on hand for Mexican Wine Cookies made the perfect poaching liquid. These took just a few minutes to prepare, and they make a beautiful presentation. The perfect finish to a light summer meal. Wash the figs and trim the stems. Place in a three-quart saucepan with sugar and sherry over medium-low heat. Once the sugar has melted and it starts to boil, reduce the heat to a simmer, cover, and poach for about 5 minutes. Remove the figs from the pan and add the butter, letting it melt into the sauce. Cook a few minutes longer, until the sauce has thickened. To serve, place 3 or 4 figs on a plate and cut them into quarters, leaving them whole at the bottom. 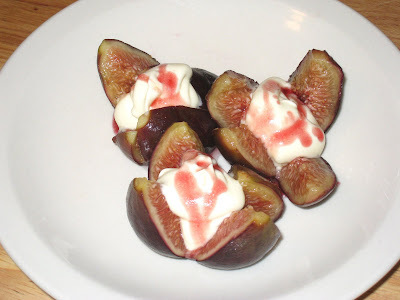 Open the quarters and drop a dollop of the creme fraiche over each fig. Spoon some of the sauce over the figs. *To make creme fraiche: Add 2 tablespoons of buttermilk to 1 cup of heavy cream in a glass bowl or measuring cup and mix well. Let stand at room temperature until it thickens to the consistency of sour cream - anywhere from a few hours to overnight. Stir and refrigerate. Will last up to two weeks in the refrigerator. Those figs are beautiful, I love them alone and have reduced balsamic vinegar to serve them over prosciutto with those beautiful gems...yours look tasty! I love figs by themselves too, Hornsfan. I love the idea of serving them with prosciutto. Prosciutto is also really good with honeydew melon. If you haven't tried that, I highly recommend it. Seems like a balsamic vinegar reduction would go well with that combo, too.